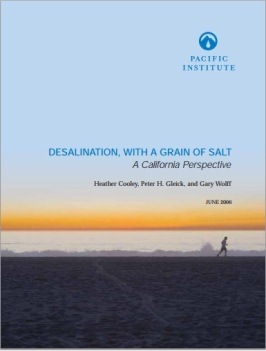 In Desalination, With a Grain of Salt – A California Perspective, the Pacific Institute provides a comprehensive overview of the history, benefits, and risks of ocean desalination, and the barriers that hinder more widespread use of this technology, especially in the context of recent proposals for a massive increase in desalination development in California.Long considered the Holy Grail of water supply, desalination offers the potential of an unlimited source of fresh water purified from the vast oceans of salt water that surround us. The public, politicians, and water managers continue to hope that cost-effective and environmentally safe ocean desalination will come to the rescue of water-short regions. While seawater desalination plants are already vital for economic development in many arid and water-short areas of the world, many plants are overly expensive, inaccurately promoted, poorly designed, inappropriately sited, and ultimately useless. To avoid new, expensive errors, policymakers and the public need to take a careful look at the advantages and disadvantages of desalination and develop clear guidance on how to evaluate and judge proposals for new facilities. The potential benefits of ocean desalination are great, but the economic, cultural, and environmental costs of wide commercialization remain high. In many parts of the world, alternatives can provide the same freshwater benefits of ocean desalination at far lower economic and environmental costs. These alternatives include treating low-quality local water sources, encouraging regional water transfers, improving conservation and efficiency, accelerating wastewater recycling and reuse, and implementing smart land-use planning.